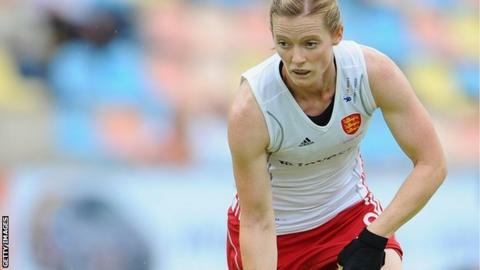 London 2012 Olympian Helen Richardson-Walsh has missed out on England's Hockey World Cup squad after back surgery. The 32-year-old midfielder, who has 249 caps for England and Great Britain, was in the squad that played two matches against Canada last weekend. But head coach Jason Lee decided he could not rely on her fitness for the tournament, which starts on 31 May. Ellie Watton and Zoe Shipperley have made the 18-strong squad. Beeston forward Watton and Buckingham defender Shipperley have 15 international caps between them, but there is experience elsewhere with captain Kate Richardson-Walsh having played in three previous World Cups. England have been drawn in Pool B alongside Argentina, China, Germany, South Africa and the United States. The top two nations will qualify for the semi-finals. "We're facing some of the best teams in the world and playing the USA in our first game on 1 June is significant as they come into the tournament off the back of winning the Champions Challenge at the end of last month," said Lee.